It's filled with free-to-play elements, but the first numbered sequel does recall the glory days—to some effect. Angry Birds 2 is long overdue. Sure, we had Seasons and Rio pretty quickly after the original game, plus Space and Star Wars—and most of those have been updated semi-regularly with additional levels over time. No doubt, Rovio has been pretty generous with those earlier premium entries. But as the market turned to free-to-play games, the company lost sight of what made the franchise great. That’s how we got middling spinoffs like Angry Birds Go, Angry Birds Fight, and Angry Birds Epic, and even the last couple free-to-play core entries—Star Wars II and Stella—didn’t have much punch to them. But Angry Birds 2 is finally here, and while it returns to the classic pull-and-fling formula of the earliest games, it also represents the biggest step forward for the series in some time. Not all of the tweaks are for the better of the game, however. 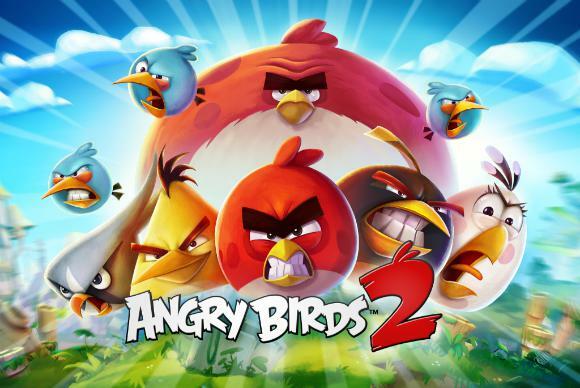 In proper sequel fashion, Angry Birds 2 goes big, amplifying many of the core gameplay and presentational elements we know and perhaps love. That’s true visually, for sure, with a beautiful new aesthetic that sets the bird-flinging, pig-popping action against watercolor-esque backdrops, and it’s paired with expressive animations and vibrant coloring. 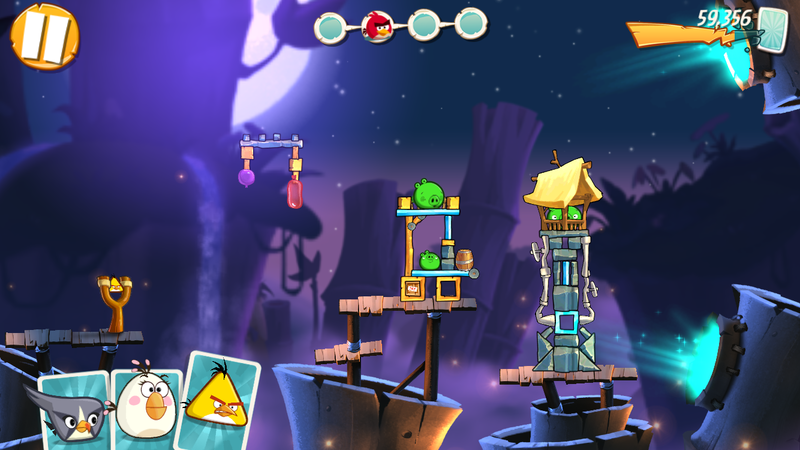 Rovio has long aspired to be a Disney-like grand creator, and at least with Angry Birds 2, it’s nailed that sort of look. Pick the bird that best fits the moment, but choose wisely: Your bird cards now have to last across multiple stage layouts. But the “bigger” approach extends to the gameplay, as well. You’ll find 240 levels in the initial free-to-play download, with more promised—and they’re now multi-stage missions that often comprise three or four different screens of structures to take down. Enabling that design is a new approach to bird use: You’re dealt “bird cards” for the familiar creatures, and you can pick whichever bird you want to use for each new fling. No longer are you bound by the order the birds are lined up. The pigs’ houses are no match for the world’s heaviest rubber duckies! Smashing up pigs isn’t the only goal anymore, either: The more blocks and beams you destroy along the way, the more extra birds will unlock to finish off the stage. And there’s one more twist: The level layouts are semi-randomly generated, so each time you retry a stage, you’ll see a different design. Some common elements tend to remain, particularly in stages with a giant boss pig to defeat, but the strategy you figured out by failing the previous attempt may not carry over to the next attempt. Angry Birds 2 thankfully isn’t too aggressive about its free-to-play elements—a welcome relief for anyone who trudged through the brutal Angry Birds Go in its early days (if it improved, I never went back). But they are there and prevalent, ever tempting you to pump in a few bucks to continue a tricky stage, buy more power-ups, or refill your lives after a particularly bad run. 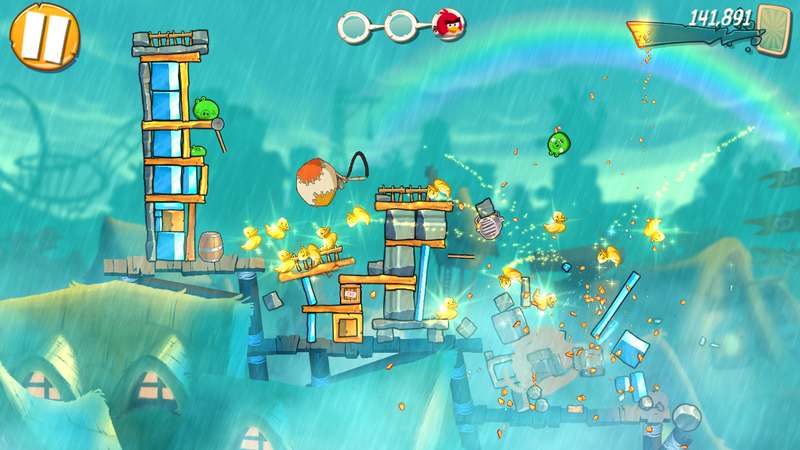 No surprise: Angry Birds 2 has an energy system with slowly-recharging lives. At least you can watch a quick commercial for one more try. The energy system gives you a maximum of five lives to work with at any given time, with each requiring 30 minutes to replenish—or you can watch a video ad to gain one back immediately. 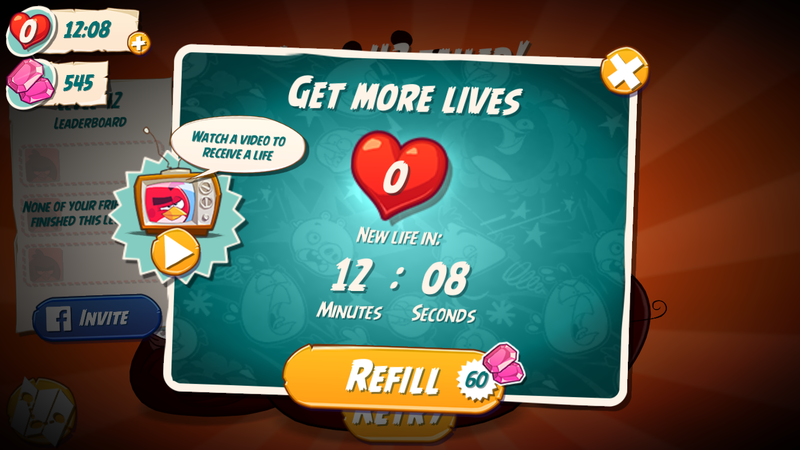 Otherwise, you can spend 60 gems to get all five lives right away, and the game provides you enough gems upfront to buy a couple refills. Beyond that, gems come a few at a time for completing missions or playing daily, but even several hours of play might not earn you enough for a single refill. Want to top up on lives, continue a stage, or buy power-ups? Gems are available by the bag, barrel, or chest. 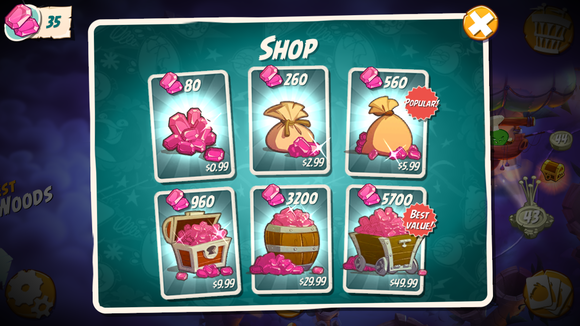 That premium currency is also used to buy extra birds at the end of a level (for 60 gems), or to purchase power-ups (30 gems apiece) that in most cases can clear an entire screen of pigs with a single use. Luckily, I haven’t seen any wait timers between worlds—on the Candy Crush Saga-style map—across the first few dozen levels, and it is possible to play without paying as long as you play in small bursts. Trying to play for long stretches of time could prove very expensive indeed. Angry Birds 2 has a Candy Crush-inspired winding map screen with loads of levels—but thankfully no world barriers in the first few areas, at least. Luckily, the single currency system keeps monetization pretty simple. If you want to skip the waits or toss in a power-up every so often, you can spend a few bucks on a pack—I dropped $6 for 560 gems—and stretch it out a bit through occasional use. 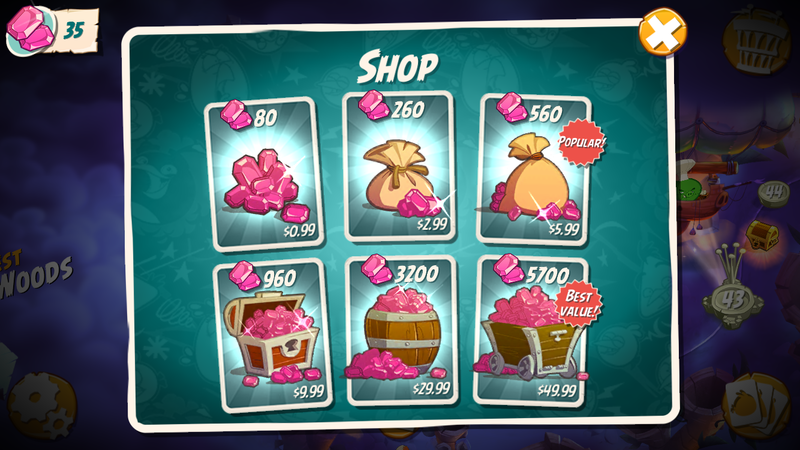 Of course, Rovio would love to sell you a $50 pack—that one nets you 5700 gems. 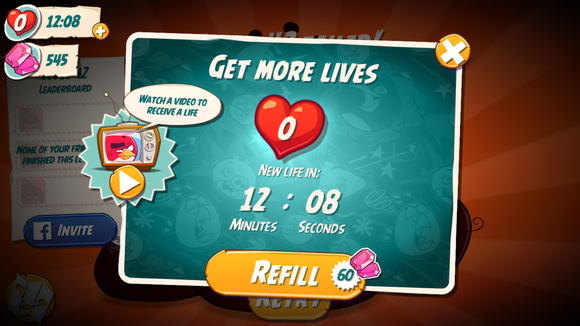 One last note: Angry Birds 2 does have some eye-roll-inducing advertisement missions that pop up from time to time. 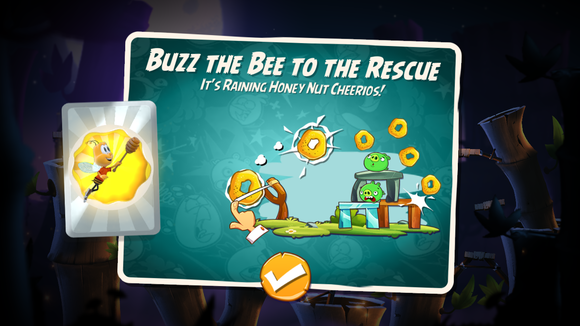 One level I encountered was sponsored by Honey Nut Cheerios, and the cartoon bee mascot became a power-up—which I was forced to use if I wanted to keep progressing. It’s just like the totally out-of-place Goldfish crackers and State Farm Insurance power-ups from Angry Birds Go, only this level ended with a nice, big photo of a cereal box. A free game is a free game, but awkwardly shoehorning a sponsor into the action comes off as slimy. Something about adver-gameplay rubs me the wrong way, especially when it’s suddenly forced upon you in a mission. 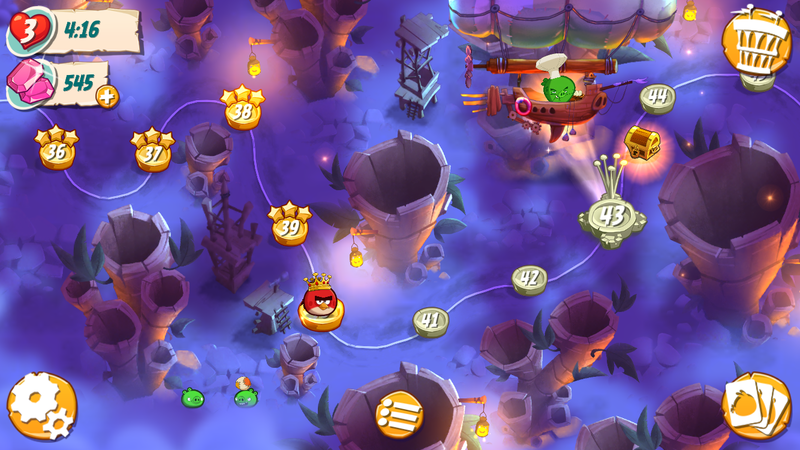 After a series of lazy spinoffs, Angry Birds 2 is a return to form—with caveats. And surprisingly, they’re not all about the freemium design. It’s the randomization that dulls the fun a bit. Rather than encounter really great, well-constructed levels that stymie and stump you, the game offers a barrage of OK levels. There was never that moment where I played a level dozens of times in a row because I was totally enthralled by the challenge. Not that I could anyway, given the lives system. It’s a play for quantity over quality, and in that respect, it’s successful: There’s a ton to play here (including the endless Arena mode), and it’s all solid. But it’s not amazing. And as the game handed out skill-killing power-ups and forced me to play interactive ads, I couldn’t help but think back to when you’d pay a couple bucks for a purer, more focused version of the game. Those days are in the past, however, and in the free-to-play era, this is probably as good as we’re going to get from Angry Birds.